Have the kids receive Valentine Air Mail from Cupid himself! This is an easy Valentine box for boys or girls, preschoolers on up - complete with an airplane made from hearts using our printable template! • Red or pink paper (only if you want to put a heart airplane on your package) or you can just use the white computer paper! 1. Wrap your box in brown paper, just as you would a regular package. Address your mail to the child's name and address, and from Cupid, who's address could be 123 Lovers Lane! 2. 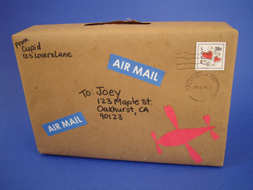 If you want to put the heart airplane on your airmail now is the time to put it together. For an easy white airplane, just cut all the hearts out and glue them on your package per the picture and directions. If you want a red/pink airplane you will have to use the printed hearts as templates to trace onto colored paper. 3. Now glue on your stamp(s) and airmail stickers. 4. You can make your package look more realistic by putting a place/date "stamp" and postage mark over your stamps. Use a pen to make squigily lines across your stamps. Make a small circle with a pen and write a city name across the top and the date in the center. 5. Use scissors to cut a hole in the top of your package and you're ready to start collecting valentines.